Back in April, I expounded on the versatile take-away containers of the Japanese-themed fast food restaurant on Elgin next to Harvey's, in the post Made In Japan: A Leftover Experience. In late August, the store was shut down, due to arrears in the payment of rent, according to the letter posted in the front window. The lettering from the sign was removed, leaving a black rectangle below the Elgin's trademark sign. The door was open one day last week when I went by, and you could see that the former decorations were still inside. Some workers were removing boxes of old merchandise. This week, one of the panels in the sidewalk-facing windows was replaced from a "franchise opportunity" plus phone number to "Opening Soon" and Quizno's logo. When I was having lunch at the Harvey's beside it on Tuesday, a constant banging of hammers emanated from the vacant store. Today (Friday) the door was open again and you could see the fruits of that labour: new walls, new paint job. Two building permits are posted on the inside door (not visible when the outer door is closed). A colleague of mine suggested Genji on Lisgar as an alternative (and, frankly, more authentic) Japanese restaurant. There's also the noodle house between Somerset and MacLaren for other asian food. Not being a big fan of sushi, I might pass; I liked the Teriyaki place more for its takeout containers. The Quizno's will be replacing one franchise fast food place with another, but it'll be better than another vacant storefront on Elgin. Recently, OC Transpo route 51 was canceled, so the bus stops going down Lyon Street are out of service. The removal of the flags at the top of the posts has exposed the decorative cap at the top of one of the posts. The beautiful brickwork on the rowhouse on James makes for an elegant backdrop. Last time, I talked about the surfaces on Bank Street. 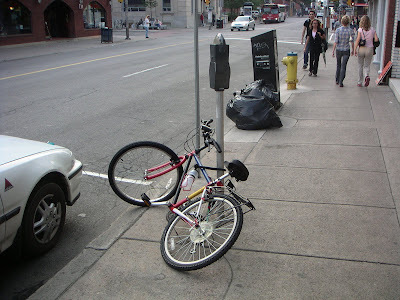 Today's post is on my favourite topic--the bike racks. As described in this panel from the March 2008 consultation, there isn't enough room on Bank for separate artworks as part of the Percent for Art program. So the decision was made to combine art with function by having bike racks with artistic designs. The most secure year-round place to lock your bike to is parking meters. However, this has two problems for Bank Street. For one, parking meters will be phased out for Pay & Display over the next few years. But they also don't support the bike at two points, as recommended in the Association of Pedestrian and Bicycle Professionals' Bicycle Parking Guidelines, this unfortunate Bank Street cyclist's bike is a case in point: it's fallen and the front wheel may get hit by a car, and passers-by may think it abandoned, inviting tripping, vandalism, and other damage. At a few of the side-street bulbouts, these ring-and-post racks were installed. There are a couple other shots of these in Part 4 of the series, benches. Ring-and-post is one of the better types of racks, though many of the ones on Bank Street were located far from where cyclists wanted to park. Here's one of the ring-and-post racks removed during construction, next to the Scotiabank at Gloucester. You can see the clump of concrete at the base of the post that served as an anchor for the bike rack in the sidewalk. North of Laurier, a ring-and-post variant, designed by a Montreal company, were installed, and are kept in place throughout the year. They certainly have a different aesthetic to them. I've heard complaints from some cyclists that these racks don't allow you to use the central post for locking a U-lock, which limits your options for securing your bike. I've noticed myself that there are too few of them around when you want to have a meeting at the Bridgehead at Bank and Albert and the committee members all got there by bike. As part of the reconstruction for phases II and III, these triangular Cora racks were installed at many corners (this one at Bank and Cooper, North-East) for higher capacity bike parking, to take overflow when the racks along the street are full. They're also better for longer-term parking than the parking meters or the artistic racks, because there's less pedestrian traffic going by to bump into your bike. They were particularly useful over the past winter, because the new artistic bike racks weren't installed until this year. They eventually came, and here are two of them installed in front of the Rogers Plus store at Bank and Gilmour. Their panels haven't been installed yet. Here are some more at Bank and Flora, looking South toward the Queensway underpass at the European Glass and Paint store. To install the racks, these cylindrical cores were cut out of the sidewalk down to the gravel, and the new racks are secured to strong foundations underneath. This one, of course, is at Bank and Gloucester looking North toward Laurier. The racks are outfitted with these fingers which hold the steel panels. The horizontal piece will also double as another place to wrap your lock around. The steel panels were laser-cut and delivered separately on pallets. There are 90 racks in all, featuring 30 different designs. 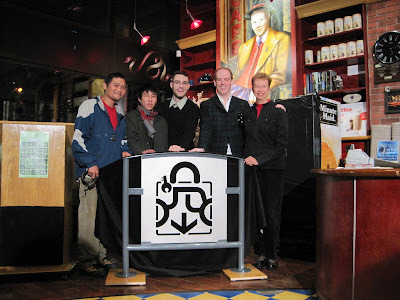 There was an official unveiling ceremony for the racks, held November 4, 2009 at Café Suprème at Bank and Cooper. Here we see one of the artists, Howie Tsui, describing the inspiration for his design to the crowd inside the coffeeshop. All the designs were on display at the event, and each design was accompanied by a description of the design written by its artist. Finally, the completed designs are installed all down Bank Street. I quite like this stylistic representation of a cyclist. And what's Bank Street without pigeons! Café Suprème serves an ideal backdrop for this design. Can you see what it is*? Be sure to check out my previous two posts on bicycle parking and design, as well as my other posts on cycling. Tune in again in a few days for the next, and possibly last, installment of this series. Last time, I shared some photos of the benches on Bank Street. Incidentally, they've removed the new benches South of Somerset, too. I think they were just doing a dry fit before removing them for the Winter. Today it's surfaces. Lots of the more interesting aspects of the Bank Street redesign is the new, broader sidewalks and the various pieces of street furniture on them, but the surfaces that stretch between the sidewalks--i.e. the roads and crosswalks--have enough going on to merit their own post. After the underground work was complete, they paved a layer of asphalt in July to contain things. Here are some of the paving machines at Gilmour in front of the Rogers Plus store, at the end of a block-long carpet of asphalt. It doesn't go all the way to the curbs, because there was still more finishing to do on them. In the final preparations for opening of the block, a pair of layers of asphalt were laid, stretching from curb to curb. This was taken in Phase II (looking North at Cooper) on November 14, 2008, with two more weeks of preparations before the street reopened. By contrast, the second layer of asphalt went on this year's segment at the end of September, as seen here looking North up Bank from Gladstone. They've refined their techniques and were able, and by November 14 this year, Bank Street was already back open! It seems more often than not that they pave asphalt right on or before a rainy day. You can see the water beading up on the surface of the asphalt. These bags of calcium chloride flakes were stacked outside Herb & Spice at Bank and Lewis. When applied, it looks like someone dropped piles of styrofoam pellets over the dusty gravel, apparently to control dust. Once the second layer of asphalt was paved, the street looked nearly ready to go. Since the streets were still closed to cars, they became a de facto pedestrian space. These folks animated the street with a street hockey game between Gilmour and MacLaren streets, using construction pylons as goalposts. Others used the closed (or open, depending on how you look at it) road to practise their skateboarding tricks. Next to come are the crosswalk markings. Guide lines were spray-painted on the crossing of Lewis so that the stop line and crosswalk lines could be drawn precisely. Most of the above describes the work done on Phase III, the section under construction this year. Last year, the majority of this same work was on Phase II, between Laurier and Somerset. Finishing touches for Phase II were done this year, and similar finishing touches will be done on Phase III next year. In this photo, taken in mid-August 2009, they've dug up one of the manhole covers at Bank and Somerset (the first photo in this post shows this being done at Bank and Cooper), and applied a temporary cold patch around it. The four holes, which were frightening to cycle over, allowed drainage and a leverage point to re-extract the manhole cover more easily. They'll need to raise it up with a spacer when they pave the final layer of asphalt. This also explains the height discrepency at the curb requiring the temporary berm--You can see the berm that was installed last year coming down off the lip at the edge of the curb. About a week after they dug up the manholes, the final layer of asphalt had been laid (although the ones at the intersection of Bank and Somerset would remain for a number of weeks). Here's a shot looking South at Lisgar again--much nicer than in the photo above from two years ago! The crosswalks have been painted, and marks made for the yellow centre line to be painted. On the cross-streets (in this case, Lisgar again), they needed to scrape off some of the old asphalt to give a straight cut for the asphalt to cover over smoothly. If you click the photo to zoom in, you can see the four holes around the manhole cover. The old crosswalk paint will simply be paved over. The final asphalt makes for a smooth transition on the cross streets. In this case, Nepean Street. In mid-September, these paint marks outlined the location of crosswalks. You'll note that they line up well with the border of the concrete sidewalk. The precast paver crosswalks help to define the crosswalk as a pedestrian zone and continuation of the sidewalk. Looks pretty good, if you ask me. Tune in in a couple days for my Part 6: Bike Racks (my favourite). Note also the upcoming CCCA meeting on Tuesday night, 7pm in the Honeywell Room at City Hall. Last time, I discussed the installation of trees on Bank Street. As posted in last year's post on Bank Street reconstruction, this ugly cafeteria chair was the closest they could come to that design. Luckily, it was only put there for evaluation purposes, and thankfully the evaluation failed. For reference, here's a shot of the two ring-and-post bike racks that used to be on that bulbout, as well as the concrete sidewalk design. This corner now contains a higher-capacity bike rack. Bike racks will be the subjecdt of Part 6 in this series. Here's another one kitty-corner from the previous photo, behind Hartman's. The protective styrofoam packaging is still on the arms of the benches. At the March 2008 open house (where the design charette above was on display), I had a discussion with the designer of the benches about the middle arm. Obviously designed to keep people from sleeping on the benches (it seems we can't fight that sentiment any more), but the arm's location in the middle of the bench made it hard to use. I mentioned that each half of the bench could only really hold one-and-a-half people, reducing its overall capacity. A mother and her son would have to sit on opposite halves of the bench. The really confusing bit was that the same week the new benches were installed south of Somerset, the benches from Laurier to Somerset were removed. You can still see the shadows where two benches had been installed on the South-East corner of Bank and Nepean. Why were they removed?! ?